Nomadic Studio was commissioned by House of Marley to create a series of 3 walk-around videos that were displayed around their booth at the 2018 Consumer Electronics Show in Las Vegas. The videos showcased House of Marley's latest Wireless In-Ear Headphones, Over-Ear Headphones, and Outdoor Speakers. At the time of production for these videos, many of the House of Marley products were still in the prototypical stage and no physical samples of the products were available to practically shoot. 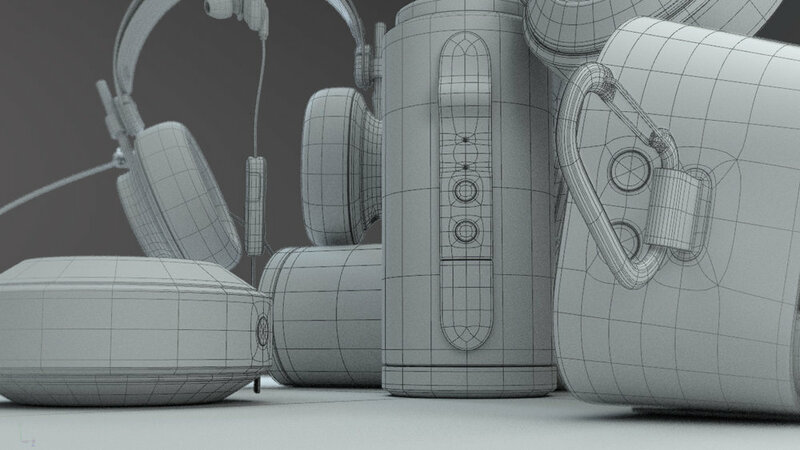 With these parameters, Nomadic Studio created each product in 3D and realistically rendered them to compensate for the lack of practical footage. Over the course of the project, Nomadic Studio modeled, textured, and lit the five different products as well as their respective color variations. The rendered 3D models were then integrated into the dynamic 2D animation to complete these colorful and informational videos for House of Marley.